Sampled from a pint glass. This beer came highly-recommended by both Bottleworks staff and one of my good friends. The pour shows off an attractive copper-orange hue, just barely see-through when I hold it up to the light. The cream-colored frothy head lasts several minutes before collapsing into a thick cap of foam. All-around pretty. Smells like pine, lemon, dried apricot, and a touch of juicy pineapple. Sugar, malt and a touch of honey here, too. Imagine the smells mentioned above are all friends who you are expecting to see at a party. Now, imagine you arrive at the party to find it’s being dominated by big, booming bass. Your friends are all there, but you can’t hear them above the bass. That’s how it is with this beer — except, instead of bass, it has bitterness. Delicious, dominant, bitterness. The grapefruit is loud enough to punch through, followed by light lemon zest and then some sweetness. Some alcohol flavor develops later on. Eventually, though, the bitterness chases all the other flavors from the party and sticks around for the long haul. The medium body results in a mouthfeel that complements the bitterness almost perfectly. The carbonation may be a bit too restrained, though, as there’s a bothersome stickiness that coats your mouth and overstays its welcome. Reading the BearAdvocate reviews, I’m a little surprised by how much I liked it. First, it looks like there may have been some quality issues a couple months ago, with complaints of oxidation and (somewhat puzzlingly), lack of bitterness. This is a good IPA, but not necessarily great. There’s no question it has the bitterness I look for in an IPA, and at 7.2% ABV, it’s definitely strong enough. But there are barely enough malt-derived flavors to back up that bitterness, and instead it’s supported by the wonderful mouthfeel. If you like bitterness in beer over other taste considerations, you will probably love this — I know I’ll be drinking it again. 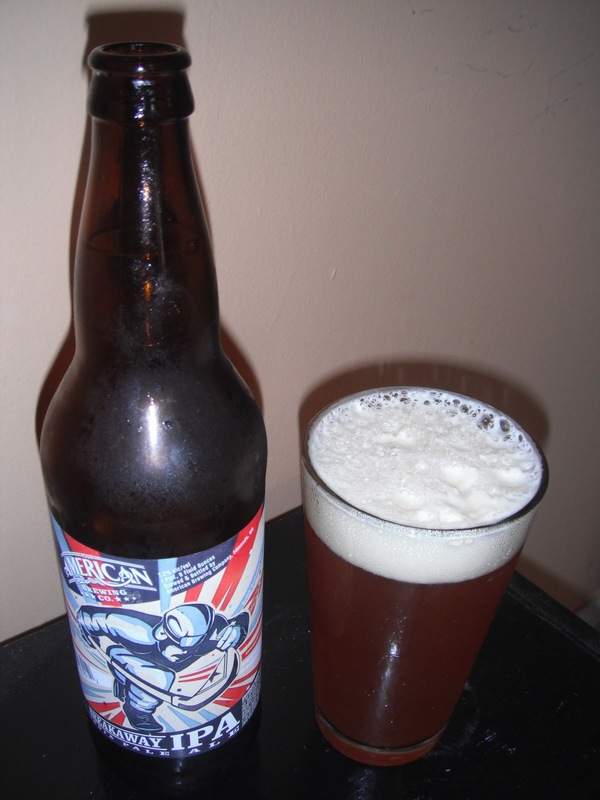 This American Style India pale Ale is a true Northwest IPA, a bold hop aroma with a floral and citrus note. Its color is a dark honey or amber tone. The flavors are characterized by a medium intense hop bitterness that is well balanced with a citrus (grapefruit) flavor and aroma along with a mild malty sweetness. Your senses score big time with this ale! Breakaway IPA is available on tap in Seattle, Tacoma, Edmonds, and Bellingham, and in bottles in the Seattle Metro area.